Allied is hiring for Nestle! 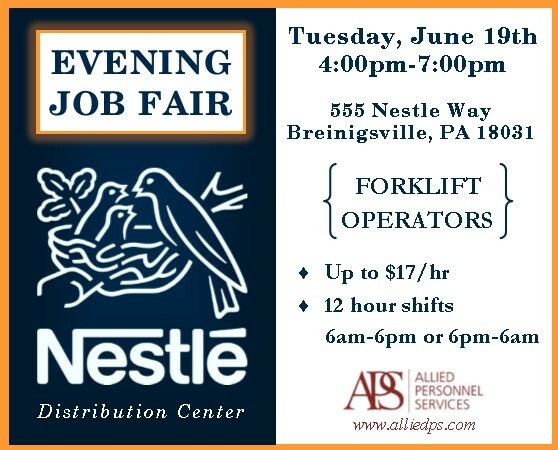 Come see us on-site at 555 Nestle Way in Breinigsville this Tuesday, June 19th, from 4pm until 7pm to apply for forklift positions. These are long-term opportunities with great potential for hire. If you are unable to attend the job fair, you can apply online, or stop by our office at 752 Union Blvd. in Allentown Monday–Friday between 8am and 5pm. This entry was posted in Job Fair, Job Search, Jobs, Uncategorized on June 15, 2018 by aps.